For any food lover, there is a meat grinder that is designed to the cutting edge. Using it in your home is considered outdated perhaps, but if you are one of the people who still love to do these things yourself, you can check for more information on this site. A meat grinder is a very versatile product. You can grind your meat to make the best hamburgers and other delicious dishes, or you can make sausages. You can also process vegetables, cheese, nuts and even make pasta with it. You can control everything that goes to your dish: the type of meat (you can create amazing mixes), fat and the overall quality. The best part is that it will pay for itself since it’s much cheaper to grind your own meat than to buy ground beef. We help you find the best tool for your needs, so can proudly say you are the one who prepared all the fantastic food for your friends and family! From start to perfection. So you’ve decided you want to get a meat grinder – congratulations! You’re making an excellent choice because ever since I bought my first grinder, I’ve been obsessed. These things are incredibly versatile because they can mince not only meat but also vegetables and fruit, creating a huge range of cooking opportunities. And it can produce fantastic minced food at a fraction of the cost it would be at the supermarket. But which type of meat grinder should you get? It really comes down to personal preference, but hopefully, the information below gives you some pointers to consider when deciding which type of grinder to get. Read our full reviews if you want to learn more about a particular product! We are working tirelessly to test more and more meat grinders, right now we have reviews about Sunmile, LEM, and STX, some big names in this industry. There are many models on the market, and without getting into specifics on the merits of individual makes of grinder, the first decision to make is whether to get a manual grinder that’s powered by hand, or an electric grinder than can be plugged in. These can be ideal for chefs or simple food enthusiast that either doesn’t mind the extra energy required with hand-grinding if those that want closer control over what is being minced. The fact it’s all hand-operated means that you’re completely in charge with the grinding. Another benefit is that these grinders tend to be much cheaper than the electric ones, so if you’re a cook on a budget, then this is probably a preferable option. Manual models are also good for smaller kitchens because they take up less space than electric grinders, which usually have a charging station and other parts. The main benefit of electric grinders is saving time and energy. Because of electricity powers these grinders, they take care of all the hard work. Perfect if medical or other problems make hand-grinding impossible, and also perfect for chefs that are in a hurry or find manual grinding to be too difficult. You can process large quantities of meat very fast when you are preparing a meal for a big family gathering. Some models can even grind bones which are beneficial if you want to make a pet food with the help of a meat grinder. We try to cover as many brands and specific products as we can. Check out our existing categories according to your preferences! 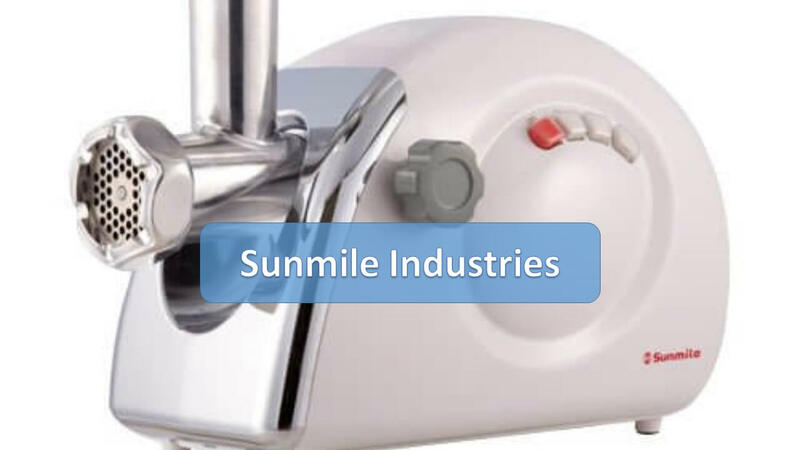 Sunmile Industries: best affordable electric meat grinders. 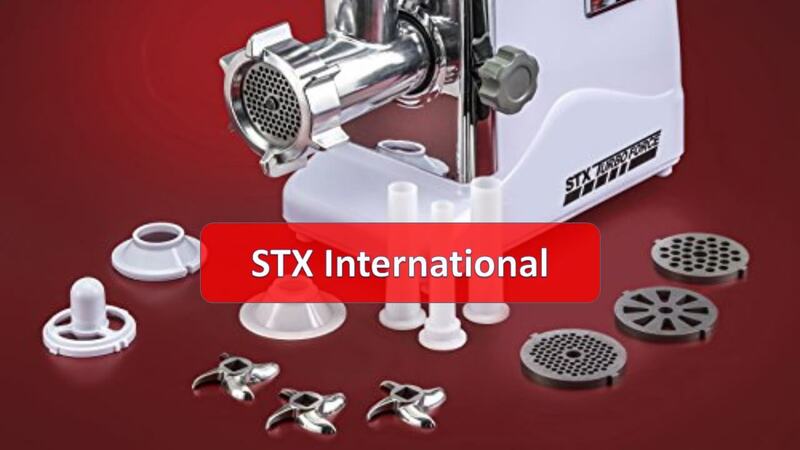 STX International: the most versatile meat grinders. 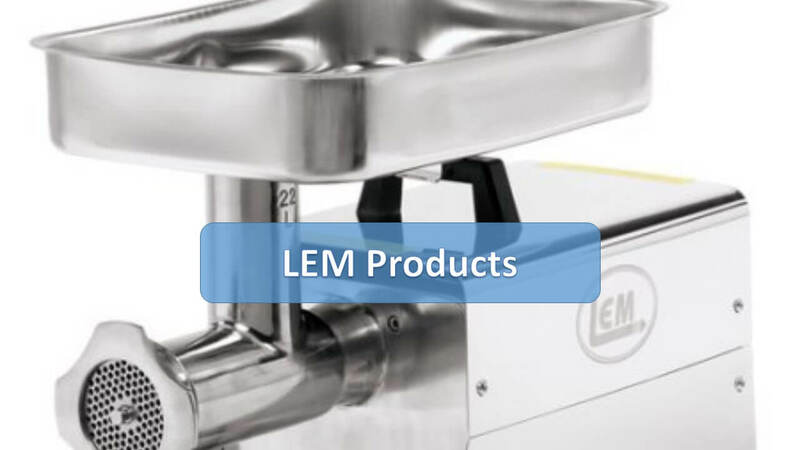 LEM Products: the highest quality & the best performance in the meat grinder industry. I love cooking and using my meat grinder so much, I could probably fill hundreds of pages writing about them — but here’s some of the things I think are most important. For a more detailed version, check out our buyer’s guide! Sausage stuffing is a grinder function that I cannot live without. Not every model comes with stuffing tubes, but it’s a great one so try to find models that have them. It’s easily attached to a grinder so that you can grind meat and fill sausage casings with it all at once. It’s just yet another way that it’s possible to make the grinder tackle many cooking projects. I recommend using electric meat grinders for sausage stuffing; it makes the job much easier! Check out the “cleaning and caring” guide for more information about how to look after your grinders, but cleaning is one of the things you need to be prepared to do. Grinders should be washed down after every use, and it’s important to see how to disassemble the various models of grinder because that will be necessary to clean them. Most of the time it’s an easy and fast process, but handle the cutting blades with care, they are very sharp! 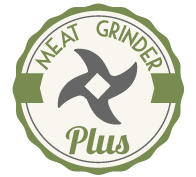 Let’s get graphic for a second – grinding meat means you’re sometimes going to end up with pieces of connective tissue or other parts of an animal that you don’t want in the finished minced product. The best way to deal with this is to look for grinders with the reverse operation, which removes material like this that can get stuck in the blades. The possibilities with grinders are almost endless! They can be manual or electric, and they can have one simple function or be adaptable to several different ways of grinding. The big range of grinders on offer is one of the most interesting things about these appliances. When you’re shopping for it, remember that the more versatile, the better. Any purchase for the kitchen is going to require some expense, so it’s important to know whether it’s worth making the investment – so here’s a handy list of the pros and cons of meat grinders to help you decide whether getting one is right for you. This is all based off my experiences with grinders, but they’ll be the same for just about any home. Meat grinders are a great addition to any household and any kitchen. You might be able to tell from the cons above that there aren’t many negatives beyond the potential cost and maybe a little bit of manual labor. So long as you can afford it, I say go for it! You can start with a cheap manual model, and if you like it, you can upgrade it later to an electric model.